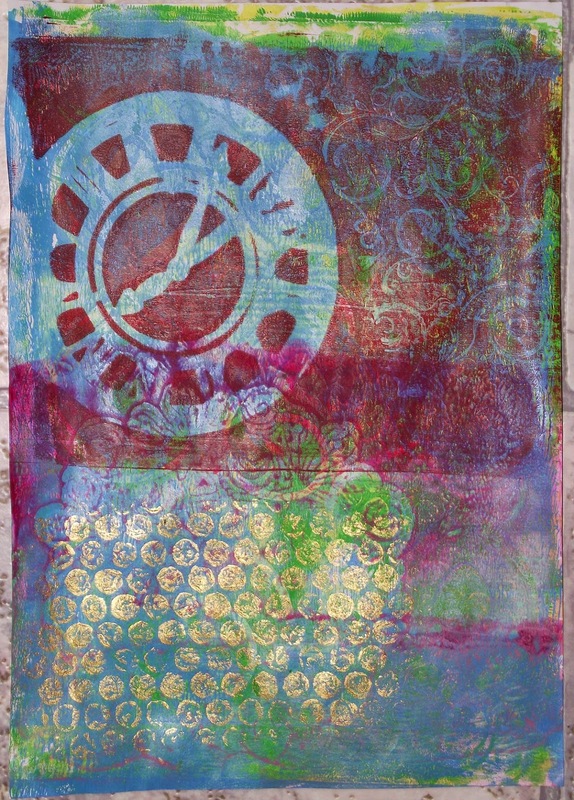 So, I have been practising with my new Gelli Plate. I still need to work out a few things, like what colours look best over others and how to do layering prints without it getting too over done pattern wise. But here are two that I rather liked from my efforts. I think I've worked out which of my stencils work best for the printing. And I would like to try making some masks of my own. Her is my first face, drawn yesterday. Not all of the faces will be turned into journal pages that I will share. Some of them may just be sketches as the idea is to practice facial features, head angels and hair styles. I think I'll do another challenge after that to do bodies. 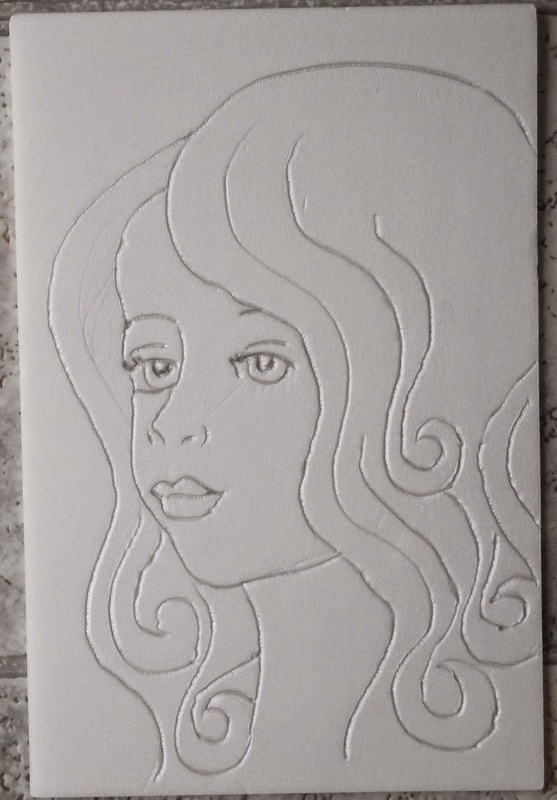 To make this journal page I used one of my own print blocks. I make these by drawing into foam sheets. Or if you would like a print, I can sell those for $2.50 each. 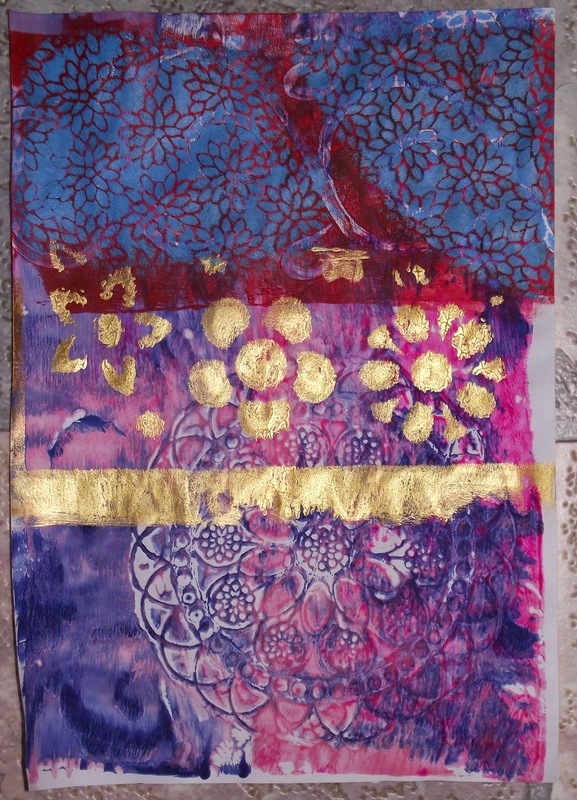 For the journal page above, I printed in a dark red on the Gelli plate, and then went over the lines with a white paint pen. I'd like to submit my latest work ... peacock Fantasy to the Mixed Media Challenge. The theme this month is bird of a feather so i went crazy with peacock feathers which I adore. Her hair piece is 3 dimensional. I sewed on suffolk puffs, a charm and a shiny button and the feathers are secured using silicone. The "beads" of her necklace are also secured using silicone. She will go on display at the Winmalee Artfest in May. Happy New Year!I finished some great projects last year, and I have some new ones already on the go. I thought I'd show some photos of what I am working on, which illustrates perfectly why this can't be a quilting blog or a painting blog, or whatever. Also for Linda in Canada, a crochet scarf. Just for fun, a watercolour. The design isn't mine, it comes from a Dover colouring book (Ed Sibbert jr) and I traced it onto watercolour paper to experiment. 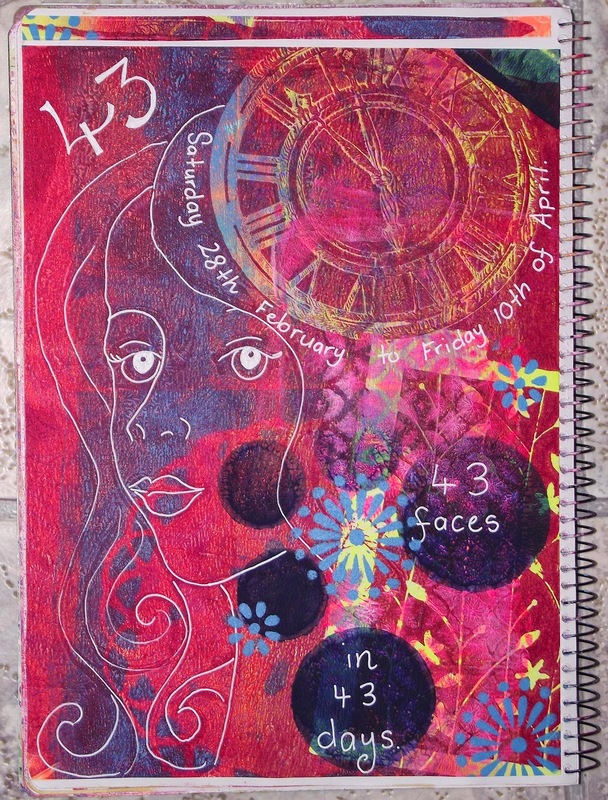 This double page is in my art journal, but is kind of a mix of art journaling and scrapbooking, as i wanted something a bit quick because for me the most important bit of this page is the writing (which I hadn't done when this photo was taken). On this page i wrote all the things I am proud to have achieved up to this date. There were big things on it like having a book published in Germany and some small things like 'I'm proud I am much better at finishing things now that I am older'. I used to be terrible at starting stories or art projects, or quilts, or embroideries and never finishing anything. Don't get me wrong. i still have UFOs but there are less of them and they have a MUCH higher chance of being discovered or my passion rekindled and the thing getting finished.